Drains, abdominal binders, and pain pumps for laparoscopic hernia repair have little written about them. A review of the current literature is included in this writing as well as the author’s opinion in the use of these adjunctive measures. Drains should be used sparingly in hernia repair except in open or laparoscopic components’ release. 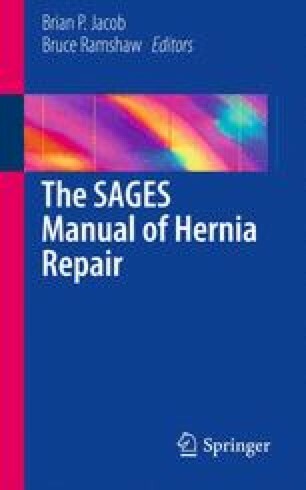 Binders may have a role in reducing pain after laparoscopic hernia treatment but demonstrate no evidence in reducing recurrence. Pain pumps are a much larger topic, but the use of regional anesthesia may be the best choice for pain control in laparoscopic hernia repair.